The Viggen is one of my all time favourite fighters (coming to think about it, there are quite a few "all time favourites"...) and back in the late seventies I built one in 1/96 scale (odd, isn't it?) and with the splinter camo. Hmm. This GB got me thinking and I'll dive into very deep waters here (I will probably drown, but hey, life is short and then you die...). My (hopeful) contribution to this GB will be a 1/24 JA-37 D(I) Jaktviggen. There is Robert F. Dorr's book which, while quite interseting in itself, has not much to offer for the modeller. Then there is BjÃ¶rn KarlstrÃ¶m's "Flygplans-Ritningar 2" which has line drawings and a few photographs of all swedish Fighters from 1926 to 1984. The drawings look very good, dimensionally and shapewise, to me and I decided to use the JA-37 drawings as a basis for my build (knowing quite well that you should not trust any drawing, in particular not even your own ones). The upscaled drawing of the book is in the background. 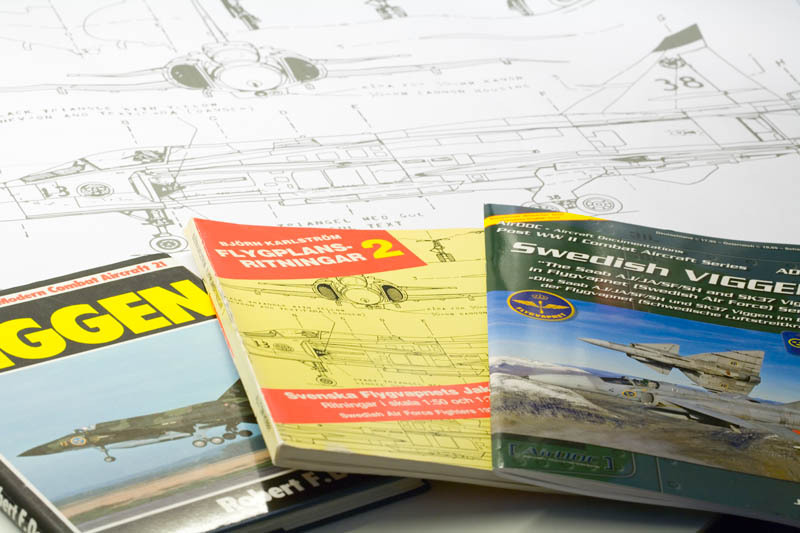 Last, there is the AirDoc book on the Viggen. I had hoped for more detail pics (like in Jake Melampy's books), but it is a very good source nevertheless. It has some artwork of nice unit markings that I didn't see before. So, well worth the money (less than 20,00 Euros over here in Germany). And of course I have downloaded tons of pictures from the internet. Still, for a model in that scale you never have enough references, so any links or other hints are more than welcome. Wow, the level of ambition in this GB is off the charts! Great project Rainer. I'm looking forward to following along. A great project to be sure. What is your plan of attack, Rainer? Are you going to do a master buck and then vacuform over it? Hi Kev, yes; I'm a bit afraid myself. Never pulled off such a project. So I keep my fingers crossed. no vacforming exept probably some smash forming of the canopy and some other parts. Apart from that I'll be following a conventional frame & stringer approach with styrene skins and lots of filing and sanding. That's the way I did most of my scratch projects and it always worked for me. Awesome choice ..VIGGEN a very nice Aircraft and one I like. Thanks, Maru. I always wanted to do one in a large scale, so this GB is a very good incentive. Thanks for the link, Lee. I hope, I can finish mine (phew, didn't even start in ernest), but I'm in no way sure of that. 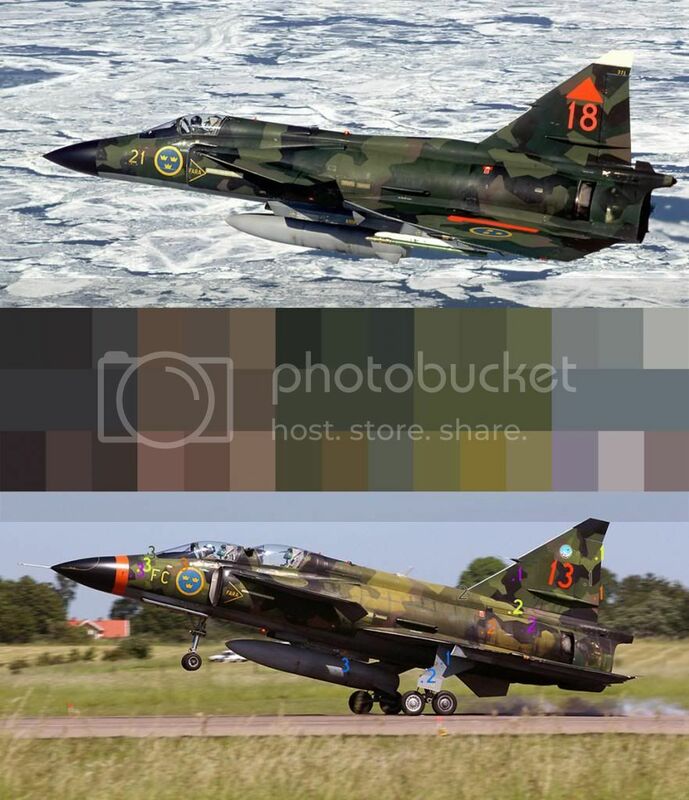 Viggen 1/24? Wooooowww !! Give the man space and oxygen !! So looking forward to this ! YES!!!! this I will follow! The colors in the middle is the best RGB (screen color) translation of the official swedish NCS colors used by the AF I could find. There is NO easy answers when the Viggen is involved! Thanks for the link, Lars. I will definitely check that out! And thanks for color comparison. One more reason to do the two tone grey scheme! Great pics - That is so useful Lars, thank you.